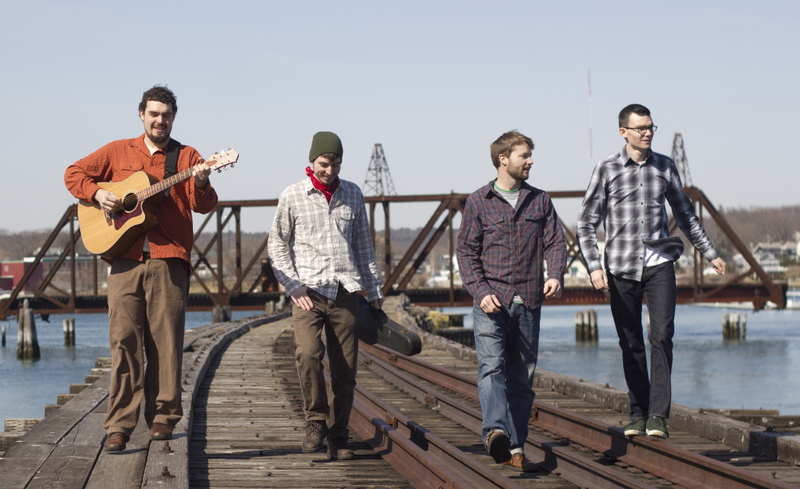 Several years ago, I discovered a Portland-based quartet, Tricky Britches, when they were coming to play at Mainely Brews. Upon listening to their “Hard Fought Day” album, I became a fan so when I learned they were making a trip back to the 1 Post Office Square venue othis month, I decided another chat with a band member was in order. Fiddle player/vocalist Tyler Lienhardt volunteered and I called him at home to find out what was up with he and his bandmates â¦ like a new album, maybe? Lienhardt: Yeah, we’ve got a new album out, it’s called “Good Company”. Q: I take it you’ll be supporting that CD when you get back to Waterville later this month. When did it come out? Lienhardt: It came out in the spring of 2013. We had our CD-release show in May of last year at One Longfellow — it was an awesome show, we sold it out — and it’s all original songs except for one old-time Appalachian tune. It’s always fun going back into the studio because you can add a lot of instrumentation that you don’t normally have available at shows. So we’ve just been touring around promoting that album. Q: Have you played Mainely Brews since releasing “Good Company”? Lienhardt: Yes, we’ve played there twice since then. Q: So folks heading to the show will be familiar with some of the material? Q: Do you change up the set much over the course of a tour? Lienhardt: Well, it depends because for the last three years we had the same four members so our arrangements and our set was pretty solid. We’ve had new material but it was the same arrangement, where as our fourth member left recently and so now we have fourth members that sort of sit in with us. It has been a challenge but also it’s been a great influx of new music and new material and new sounds which is always good for your ears as a musician — and just to keep things interesting. Q: That can breathe new life into some of the older material or whatever material you’re doing, I would imagine. Lienhardt: I does — it totally does. Sometimes we’re playing with a five-string bluegrass-style banjo player, sometimes we’re playing with a country guitar player. That’ll totally put a different spin on whatever song it is that you’re playing. Q: That’s got to be neat because not only does that recharge you but it gives the audience a chance to see some spontaneity happening. Lienhardt: Definitely, yeah! And not only does it recharge you, but it makes you play differently, too. When somebody adds a different vibe to the song then suddenly that you’ve been playing to that song — on your own instrument for maybe years — will change too sort of fit that new vibe which makes it a whole lot of fun for us as musicians. Q: Who’s left as far as permanent members go? Lienhardt: That would be myself, Tyler and Jed (Bresette) and Seth (Doyle). Q: Do you know who the fourth member will be for that show on the 18th? Lienhardt: It’s not confirmed yet. We have a couple of people that we kind of go back and forth between depending on whose available and we’re not sure whose available for that one yet. Q: Was your previous album mostly traditional songs you made your own? Lienhardt: “Hard Fought Day” was also mostly originals, however they were very influenced by traditional Appalachian music, traditional fiddle music and a lot of old-time country and that sort of thing — a lot of classic country influences. Lienhardt: I would say the new one has a lot more of a jazz influence — although there are still a few tunes that are very old-time — and more of a country/rock influence, as well. It’s the same four members as the last album although we did get some guest musicians on it, as well. Some dobro, some claw-hammer banjo which is the traditional style of banjo for square dances and contra dances â¦ stuff like that. Q: Is there anything you’d like to pass on to the fans up in central Maine about the Mainely Brews show? Lienhardt: Well, we’ve had shows there where we have had a full dance floor and we have had shows there where people are more in the listening mode. If we can get the younger fans — the college kids — there, they will usually dance. Once you get people dancing, you can maintain that momentum and it just feeds off itself, you know, that’s always our goal!